It is ideal for low volume applications. 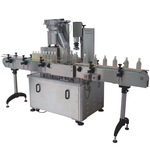 Very easy to use, only place the cap on the bottle and slide the bottle to the positioning rest. 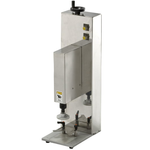 Benchtop Pump Dispenser Capper CW-100 is ideal capper for any kind of screw cap. Pump dispenser cap compatible. 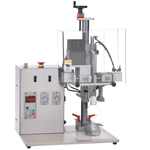 CW-450S which can be customised to suit the application. 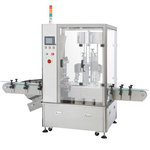 It can be integrated into an existing line or supplied as a self contained unit with in-feed, out-feed systems. 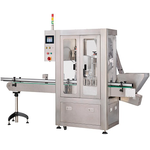 It is a complete capping system which includes the cap bulk supply, cap orienting and delivery, cap placement and tightening, and container ingress, staging and discharge onto the customer-supplied existing conveyor. 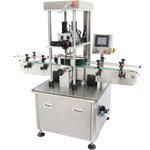 It is versatile monobloc starwheel based, fully automatic capping machine which can be customised to suit the application. 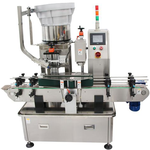 It is high speed rotary capping system easy to get 80 BPM capacity. CR-450 is designed for various kinds of cap with Precise wire cutting capping head, fit to cap with perfection which can ensure high qualities.